made use of the benshi and his distancing role during the formative period of their mature styles. They postponed coming to grips with sound until they felt capable of maintaining, in and through their mature styles, a “traditional” distance with respect to Western representationalism as reinforced by synchronous sound (2). Narrative as such is not foreign to Japanese tradition; it is, on the contrary, omnipresent, but its modes are radically different from ours…in kabuki and the doll theatre the primary narrative dimension is isolated, set apart from the rest of the theatrical substance, designated as one function amongst others. In the West on the other hand, since the eighteenth century, our major narrative arts – the novel, the theatre and more recently the cinema – have tended towards a kind of narrative saturation; every element is aimed at conveying, at expressing, a narrative essence. Even in much of nineteenth-century opera, the musical text was regarded as an exteriorisation of inner states (feelings, unstated conflicts, memories, etc.) implicit in the libretto (3). In performance, the music of an opera is analogous to the most emotionally compelling and poetic effects of narrative cinema, the effects embodied in gesture, movement, staging (including how the characters relate to each other spatially), tone of voice (and other paralinguistic accompaniments to the dialogue), the soundtrack, both effects and music. In the best of mainstream Western cinema, these strands of discourse intertwine in a mutually reinforcing representational system that is often most potent when operating on the spectator outside his or her conscious awareness. Conversely, “the semantic dissociation effected by the benshi” (4) is characteristic of the Japanese approach to narrative. Burch goes so far as to invoke the traditional Japanese doll theatre, with its “division of labour between presentational image and representational voice” to underpin his detailed and compelling analysis of the formal strategies of The Only Son, which he rates as Ozu’s “supreme achievement” (5). For the spectator, perhaps the most immediately apparent examples of Ozu’s formal systemic are the repeated passages in which the narrative action is held visually and spatially in suspense, or at a distance. Sometimes, the protagonists are absent from the frame; on other occasions, composition and focus may be organised in such a way that they are indistinct, and certainly not the centre of attention. When I last saw Only Son, at the National Film Theatre in London, one such composition, coming immediately after a reel change, was so radical that members of the audience called out to the projectionist: “Focus!” In fact, the image was in perfect focus, but the centre of visual attention was not to be found where viewers were expecting to find it. Burch, “proposing a loose analogy… with classical Japanese poetry” has termed such structures “pillow-structures,” and the “cutaway still-lifes” that comprise them “pillow-shots.” (6) I personally find them extremely powerful emotionally; perhaps this is a result of a tension between their quotidian content and their lack of explicit human presence. Even before encountering Burch’s analysis (first in seminars I arranged at the Slade School, University College London) I was in no doubt that The Only Son is one of the greatest films ever made. 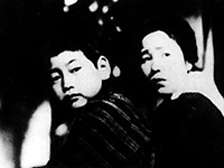 Burch hardly engages with what we would now call the film’s sound design, and it is a sign of the cursory attention critics and historians grant to the aesthetics of sound that my research has yet to reveal who collaborated with Ozu to generate this wonderful track, with its anticipation of musique concrete (10). I would need to see the film again to offer anything approaching an effective analysis; suffice to say that it makes rich use of the similarity between the sound of Japanese musical instruments and the quotidian sounds of, particularly, the life of the mother who has worked so hard to give her son an education and chance of success. Tadao Sato, “From the Art of Yasujiro Ozu”, Wide Angle vol. 1, no. 4, 1977, pp 44–48. This article discusses Ozu’s style of filmmaking and how it relates to Japanese culture. During an international conference of film schools in Tokyo in 1974, I remember our hosts showing us a student film in which there was a consistent failure to match screen direction. If anything, this added to the film’s impact. We also toured the NHK television production studio, and noticed that sets were typically constructed on platforms some feet above the floor, thus making low-angle shots easy to set up. Noël Burch, To the Distant Observer: Form and Meaning in Japanese Cinema, Scolar Press, London, 1979, p. 79. Burch, 1979, pp 167, 160. In this context, I must offer a mea culpa of my own, for anticipating, on page 55 of Soundscape: The School of Sound Lectures 1998-2001, the collaboration between Akira Kurosawa and Toru Takemitsu by more than a dozen years! See Soundscape:The School of Sound Lectures 1998-2001, ed. Larry Sider, Diane Freeman, and Jerry Sider, Wallflower Press, London, 2003.